Last week in High Performance LED Light, Part 1 we took you through the production of an amazingly bright handheld spotlight or bike headlight. This week, we cover the building of two types of incredibly bright flashing red tail-lights. 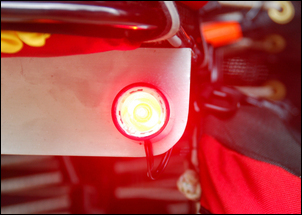 They’re perfect for bike tail-lights or as emergency roadside breakdown beacons. We’ll cover two different designs. The first is a single light with a very bright, relatively narrow beam. The second design approach uses multiple LED lights than can be equipped with wide or narrow angle lenses. To reduce the cost of the light, we’ll use some recycled and salvaged parts. So what can be scrounged at low cost? Three things: the heatsink, the glass focussing lens and the housing. Any discarded PC has heatsinks that are suitable for Luxeon LEDs. In fact, if you’re happy to chop up a heatsink, you’ll find something to suit in nearly any old hi-fi amplifier or receiver. As with all the scrounged components mentioned in this story, it makes sense to collect heatsinks over a period – they take up little space, and having a variety makes it more likely that you will be able to select just the right heatsink for the application – and, if you decide to get rid of them all, any scrap metal dealer will give you cash for the aluminium! 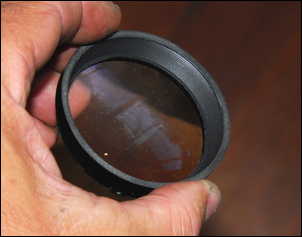 While the 3-inch magnifying glass used in last week’s project works extremely well, if you want a more compact light, or one with a wider beam, you can do even better. How? Well, whenever you see quality glass lenses available at low or zero cost, grab them. Old slide projectors have heavily curved glass lenses in their condenser assemblies, ‘projector’ beam car headlights have even better quality curved glass lenses (these are often unbroken even when the front glass lens is damaged, so can be salvaged from discarded headlights at zero/low cost [but beware the sharp glass edges when doing this!] ). But perhaps the best compact and effective glass lenses are the front elements from 35mm SLR camera lenses. These are optically brilliant, have very high light transmissibility and are multi-coated. At garage sales and the like, the lenses can be picked up for a few dollars – then it’s just a case of pulling them apart. Last week we used a stainless steel cup as the housing for the light, but lots of other objects can also be used. Small stainless steel containers (eg for food), small and large aluminium drinking cups (where the cup can also become the heatsink!) and many other kitchen and household items are suitable. I find the best collection place for these items are the kitchen bric a brac sections of charity shops. A stainless steel drinking cup was shortened and a large diameter hole placed in its bottom. A further hole was drilled in one wall for the mounting bolt. ‘Working’ stainless is difficult so you’ll need to be patient and careful. The heatsink was drilled and trial-bolted to the cup. The 3W LED was glued to the heatsink with thermally conductive heatsink glue (Jaycar Electronics NM2014 - don’t use ordinary glue!). using heatsink glue saves having to bolt the LED in place. A large amount of silicone was then used to glue the collimator and its housing to both the LED and the heatsink. A vibration-resistant structure was required and this achieved that. 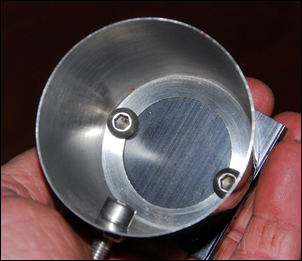 The heatsink/LED/collimator assembly was bolted to the cup with an O-ring placed in between. 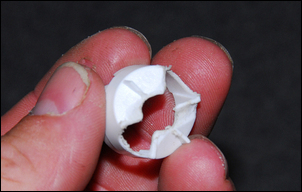 A ‘dressing’ comprising a cylinder of foam rubber was slipped over the LED to hide the silicone. 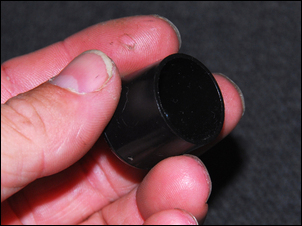 The Canon front lens element (complete in its own housing) was then siliconed into the mouth of the cup. The lens housing was tapered, making for a good match with the cup. At least an hour of experimentation was undertaken before the above design was settled on. With these focussed lights, the brightness and width of the beam depends on the optical relationship between the LED output, the collimating lens, the glass lens and the distance between the lenses. I find the easiest way of devising a good design is to have the LED mounted on a heatsink and powered-up appropriately. I then place the assembly on the bench, aimed at the ceiling above. In a semi-darkened room, different combinations of collimators and lenses result in clear variations in beam width and brightness. It’s important that this part of the development process is stressed: it’s quite easy to select what looks to be a good glass lens only to find that the lens absorbs a lot of light (ie its transmissibility is low) or the resulting beam pattern is nothing like you’d guessed it would be! 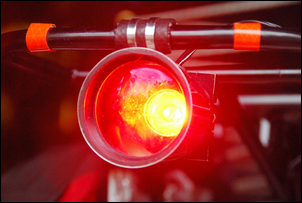 The tail-light (or roadside emergency beacon, or...) described above has an extremely intense beam. However, it is most visible when viewed on-axis – that is, by someone directly in line with the light. 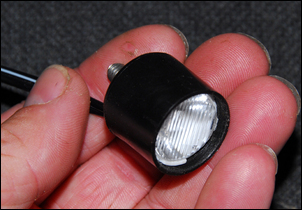 This is a quite common trait of high intensity LED lights, and in many situations is no disadvantage. However, there are situations where you want the light to be visible from wide angles. The best way to achieve that is to build multiple, small LED lights and position these to cover the required viewing angles. 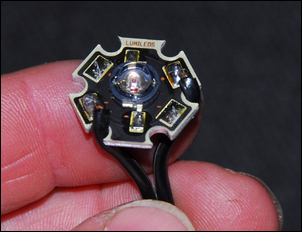 By using Luxeon LEDs and off-the-shelf collimators (internally reflecting lenses), it’s quick and simple to build very effective lights. They’re also extremely light in weight – much lighter than the designs covered so far in this series, that have both used glass lenses. And don’t worry about the simple aproach – these are still extremely bright lights. 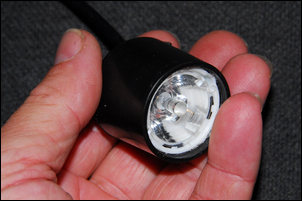 To keep total power consumption down, it is best to use multiple 1-watt LEDs. Two different sized collimators are available – 20mm and 30mm. The smaller size is also available in a special wide-angle design that gives an oval-shaped beam, while both sizes are available with various round beam angles. You can buy collimators (and the LEDs themselves) from Jaycar Electronics www.jaycar.com.au or directly from Luxeon – see www.luxeonstar.com. Buying direct from Luxeon works very well – the prices are cheap, the international service good and the variety of special parts (like oval beam collimators) is better than you’ll achieve elsewhere. The first step is to solder the wiring to the LED. Select a plastic chair leg tip to suit the size of the collimator. The collimator housing may need to be modified with a file to clear the LED wiring. (Pop the acrylic lens out before filing the housing!) 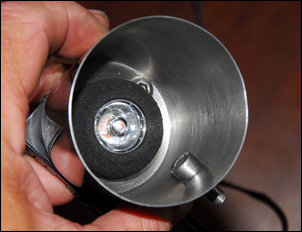 Drill holes in the cup for a mounting bolt and to allow the wiring to exit and then using clear silicone, glue the collimator in place – it should firmly hold the LED in place. 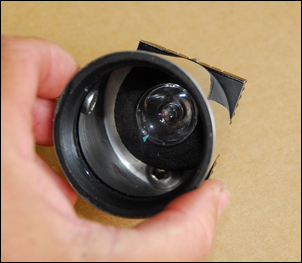 ...and here is an oval-shaped light made with a 20mm collimator. Note: you cannot power a Luxeon LED by connecting it straight to a current source eg a 12V battery. If you do so, you will immediately kill the LED! 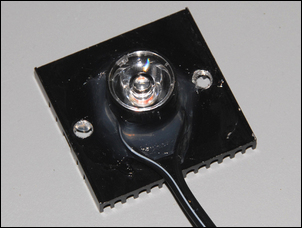 The 3W Luxeon LED used in the High Intensity Narrow Beam design requires a drive current of 1 amp at about 3V. The voltage may vary a little from batch to batch and with LED temp, but the 1A current must be maintained. 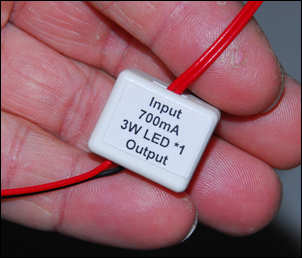 It is this requirement that the LED be driven from a constant current source that means the LED simply cannot be connected straight across a battery. As with any LEDs, a resistor can be used in series with the LED to limit the current flow. This calculator led.linear1.org allows you to easily work out the required resistor. For example, to drive the 3W LED from 12V you need to firstly look at the specs – a forward voltage drop of 3V and a current of 1A. Plug these figures in and the calculator suggests a 10 ohm, 10 watt resistor (or a 10 ohm, 20W resistor if you want the resistor to stay cooler). Note that the resistor is dissipating (wasting) about three times as much power as is being used to light the LED! It is much more efficient to use a dedicated LED driver module rather than a resistor – well, that’s the theory, anyway. Last week we used a Jaycar kit to power the LED but this time we thought we’d take the easier path of buying a pre-built module. We ordered a driver module from the LEDsales – see www.ledsales.com.au. It promptly arrived but bench testing showed that it had two major problems. One of the beauties of using multiple 1W LEDs is that they can be wired to make the best match with the battery voltage, allowing the use in most applications of just cheap resistors without then wasting a lot of power - or those resistors getting hot. Using the series/parallel calculator at led.linear1.org is the easiest way of seeing the options. Punch in the specs for a 1W LED of forward voltage of 3V and current of 350mA, list a supply voltage of 12V and use four LEDs, and you’ll see that a series array pops up that requires only a single 1 ohm resistor and has a calculated efficiency of about 97 per cent! Whatever the approach to driving the LED(s), remember that a LED is a polarity conscious device – it needs to be connected the right way around. So how bright are these lights? The answer is: very! The High Intensity Narrow Beamlight is visible from hundreds of metres – and that’s in broad daylight... At a night viewing distance of 400 metres or more, it is super bright – and you can expect to be able to see it from something like a kilometre. 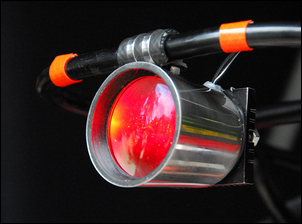 When fitted to the back of a pedal machine, it will light up reflective signs and roadside reflectors for hundreds of metres behind the cycle – massively improving a cyclist’s visibility to oncoming traffic. The range of the Multiple Wide-Angle lights depend on the collimators that are used – a narrow beam collimator will give extended range but at a tighter viewing angle. A good approach is to use a variety of collimators – for example, in the four-LED system covered in detail next week, I used two large diameter, narrow beam collimators and two smaller oval beam collimators. (Note: the ‘narrow beam’ collimator is still much wider than the High Intensity Narrow Beam light described earlier in this story.) Arranged suitably on a pedal machine, the relatively narrow beam rear lights are visible for many hundreds of metres while the wide-angle side lights can be seen from anywhere within a near 180-degree field. Next week: flashing high power LEDs, and a complete lighting system installed on a Human Powered Vehicle.